Betty Soo TCA artist pictured with Felipe Martinez of Van Horn at the local Nutrition Center. 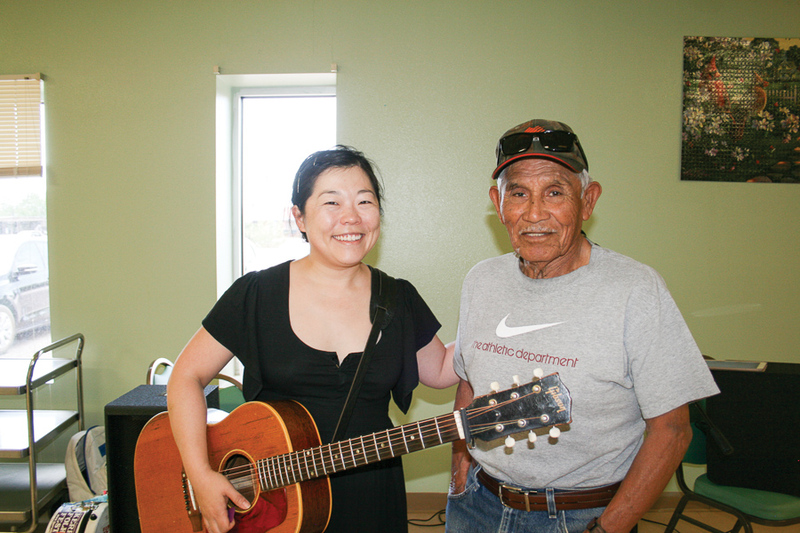 Folks at the Culberson County Nutrition Center received a special treat Tuesday with their noon meal with a visit from touring artist Betty Soo. Soo provided musical entertainment with her acoustic guitar and a folkloric set of medleys. Later that evening, Soo also performed her concert at The Clark Hotel and Museum to a large crowd of locals. Soo is from Austin where she has lived for the past 13 years. She has been a performing artist for The Texas Commission on the Arts (TCA) for several years. She has traveled through Van Horn before but was delighted to have been invited to visit for the program. TCA sponsored Soo as a rural outreach program that provided the free performances by Texas artists to designated rural counties. These designated counties include Culberson, Hudspeth, Pecos, Reeves, and Ward counties. As a Texas Commission on the Arts Texas Touring Roster artist, Soo was selected to provide these performances to nonprofit organizations or units of government.